When twins Oz and Lily’s family inherit their great uncle’s old house, they are grateful for the extra space, as there is a new baby on the way, but also very much intrigued by the old chocolate factory that is downstairs. Lily can feel straight away that this is no ordinary place and the appearance of a talking cat and rat, invisible to her parents confirm what she suspected: the shop and house ooze magic, and it seems it is a family affair too. Soon the twins find themselves involved with the secret services, trying to thwart the baddies’ villainous plans to steal their family’s secret recipe for immortality chocolate. 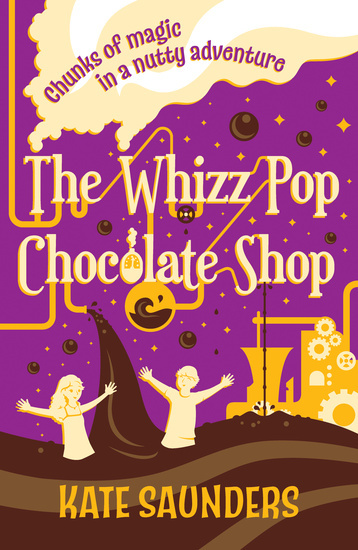 The Whizz Pop Chocolate Shop has all the ingredients of old fashioned magical tales but with very contemporary setting and themes. Think Mary Poppins fighting terrorists, literally. It offers a great combination of adventure, mystery and peril with an often light-hearted tone and many hilarious moments. Yet, amidst all the magical wackiness and crazy chocolate making, lies a beautiful story of love, loyalty and atonement. The real star of the book is undoubtedly, for me, Isadore. To start with he is cantankerous, revengeful, and a drunk. After his encounter with Oz, this soon turns to melancholy as a reminisces on his previous life. Yet, thanks to his developing friendship with the boy, the reader witnesses a true transformation, and this journey takes him eventually to acceptance and redemption. I think what is truly magical in this is that actually, despite all the magic, there are no spells involved Isadore’s metamorphosis, but love and the bonds of friendship. It is truly heartwarming, and I will confess that I felt very emotional at the end of his story. Another interesting theme that runs through the book is that of dyslexia. Lily is shown as severely incapacitated by it, and the feelings that come with struggling with dyslexia are described with great care and sympathy. I loved how her dyslexia is explained as being a side effect of her magic abilities. Obviously, children coping with dyslexia in the real world cannot claim that is the case, but I think what the author tries to express nonetheless is that children with dyslexia are special, and certainly not stupid. I really enjoyed The Whizz Pop Chocolate Shop. It is a fast-paced, engaging story which will be perfect for young readers who have enjoyed more traditional tales such as Famous Five but are now ready for something more contemporary. Many thanks to the good people at Scholastic for sending me a review copy of “The Whizz Pop Chocolate Shop”.